Architectural Shingles (arc-tec shingles) are a step up from the three tab shingles. These shingles were developed in the seventy's,as a improvement and to be a higher end shingle. They are made of a heaver mat base than the three tab shingle,and consist of fiberglass or organic material, and asphalt. They are normally treated to prevent algae build up. These shingles carry a higher rating than the three tab shingles, thirty (30) and forty (40) year ratings, compared to three tab at 15 to 25 years. They are 100 to 200 lbs. heaver per square than 3 tab shingles and are said to withstand winds up too 120 miles per hour . A three dimensional appearance, due to multiple layers laminated together, gives them the appearance of wood or slate shingles,and are offered with many colors and styles to pick from. This diagram shows how to shingle a roof with architectural shingles. Preparing the roof for architectural shingles is the same as for three tab shingles. The ice and water shield is placed on the bottom edge and 15lb felt ( tar paper) is applied to the rest of the roof. Drip edge is placed, and nailed to the perimeter of the roof. A starter row is required to prevents water from leaking into the roof, from the gaps between the shingles. If using shingles reversed for the starter row, three tab shingles should be used , not the arc-tec shingles .The three tab will create a flatter surface for the first row of shingles. Care should be taken that the end joints of the starter row, are overlapped by the shingles of the first row of arc-tec shingles. Unlike three tab shingles ,arc-tec shingles do not require chalk lines to be placed on the roof to align the shingles too. There are no tabs to be lined up and this is what makes them an easier shingle to install. 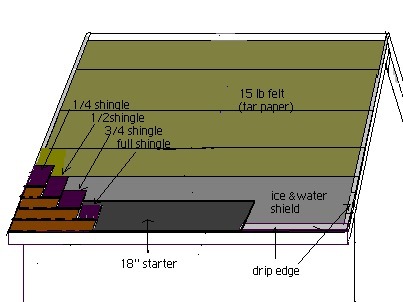 As shown in the diagram , the first shingle is placed at the lower left corner of the roof and aligned with the drip edge at the left end and bottom edge of the roof. It is then nailed in place. Nailing, is normally with four nails , just under the tar strip ,spaced so they will do not line up with the joints of the shingles above. The second shingle is cut at a point equal to ¾ of the shingle. A example of this would be, if the shingles are 40'' long, then a ¼ would be equal to 10'', a ½ would be equal to 20'' and ¾ would be equal to 30''. The ¾ piece is aligned over the first shingle,setting aside the ¼ piece to be used later. The third row shingle is cut in half ( 20'' as in our example) and align over the second row shingle,setting aside the other half of the shingle to be used later. The next row will be started with a full shingle and the proses is repeated. On the sixth row the ½ shingle, that was left over from the third row, can be used. This method of staggering the joints eliminates the every other row of joint alignment,as with the three tab shingles. 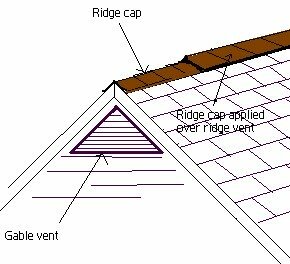 The procedure for the ridge cap is exactly the same as for the three tab shingles. Three tab shingles of the same color as the arc-tec shingles are cut to be used for the ridge cap. For more information on roofing options, follow the links below.